The Weber Q 2200 is the cornerstone of Weber's popular Q-line of portable grills, and when it comes to a true portable grill that you can fold up and carry away, this one is about as big as you can get. With 280 square inches of grilling space and a hood that gives enough room to grill a whole chicken or large roast, it is as versatile as a single-burner grill can be. However, at 42 pounds and requiring a two-hand carry, this isn't the most portable of portable gas grills. It is small enough, though, to fit perfectly on an apartment balcony and inside the trunk of a car. This little grill can cook up burgers, steaks, and chicken for several people, offering efficient design and Weber quality, making it a good investment. The Weber Q 2200 isn't as powerful as a standard gas grill, but it is certainly worth looking at in the portable grill category if the specs meet your needs. 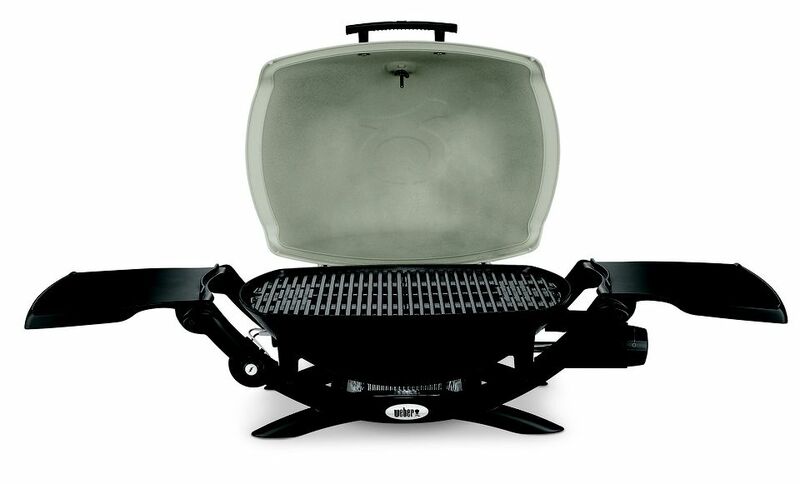 Ideal for camping, small outdoor spaces, and semi-permanent placement (such as using it at a vacation rental as opposed to tailgating), the Weber Q 2200 is well made and powerful for its size and boasts a cooking area that will feed three to four people. The shell is cast aluminum. This holds the heat and makes this grill better than most portable gas grills, which tend to lose a lot of heat through their thin steel shells. The cooking grates are heavy porcelain-coated cast iron, and the stainless steel burner tube provides even heat throughout the grill. A hood-mounted thermometer lets you keep track of your food's progress. The Weber Q 2200 is fitted with glass-reinforced tables on each side, providing a convenient spot for sauces and spices. The two-piece cooking grates can be swapped out or combined with a optional griddle accessory that is sold separately. Being able to turn your grill into a griddle adds even more versatility—the griddle is ideal for cooking pancakes and even works as a searing plate. All in all, if you are willing to pay for this portable and don't need it to be very portable, then this is a good choice. The Weber Q 2200 has a large cooking area for a portable grill, and the full open gas grilling gets you as close as possible to "real" grilling. However, at 42 pounds, it is pretty heavy—add fuel, tools, and food and you won't want to take this very far. It is also one of the more expensive portables.